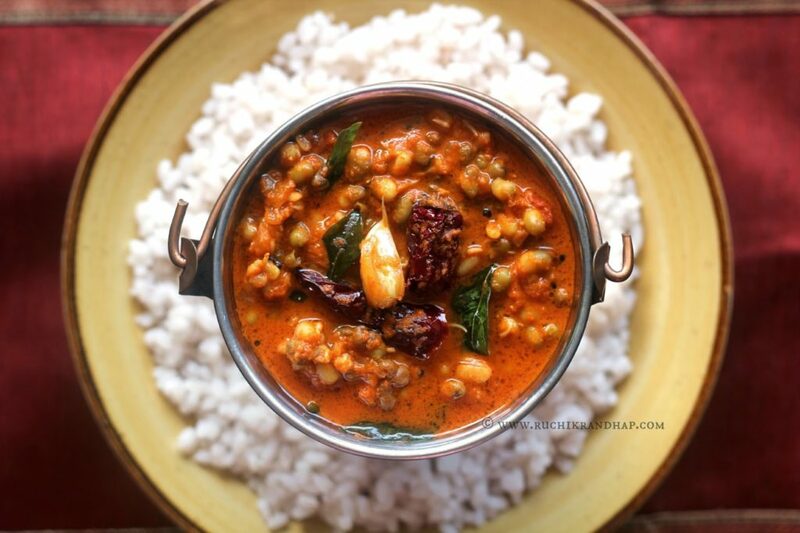 This Lent has seen me trying out various vegetarian recipes – mostly Mangalorean, and I am thoroughly enjoying this experience. 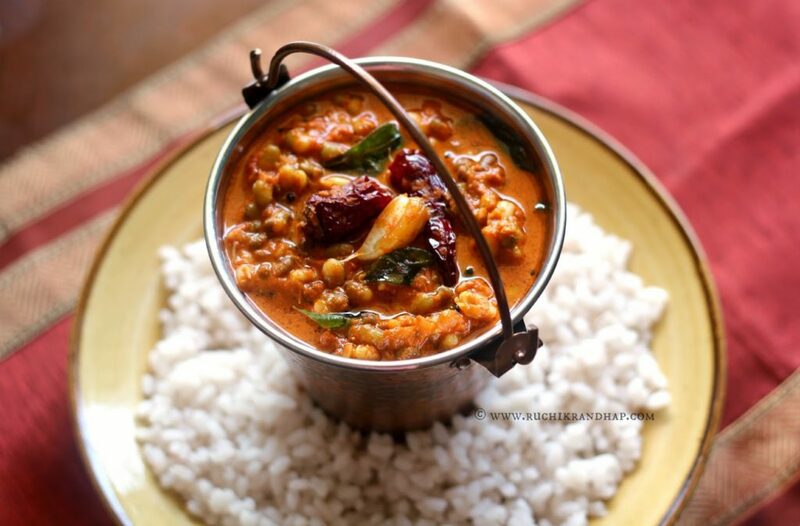 Mangalorean cuisine is a treasure trove of recipes from every community and there are so many similarities in our recipes albeit a few change in ingredients or measures here and there. Every time I try out a recipe which works for me I fall in love with our cuisine all over again. Most of our vegetarian recipes are coconut based but a good number of them are made with onions, yogurt, buttermilk or lentils as a base. I personally prefer the coconut based curries as I find them to be more delicious, no other reason. Also, the use of coconut ensures that you get sufficient gravy if you are a rice eater (I like lots of gravy on my rice). Anyway, this recipe is a family favourite, my mother made it a lot when I was a child but somehow I don’t remember eating it much during my growing up years. Maybe that’s the reason why I didn’t really make it too often after I got married. There are tons of vegetable+legume combinations one can try out with a spicy coconut gravy base. The usual and most favourite combo I use is Valchebaji Ani Guley (Malabar Spinach with Black Eyed Beans) but the masala for that curry is a little more elaborate than this one. I adapted this recipe from my friend and co blogger Charishma’s blog and it was a hit both the times that I tried it – so thanks a ton Cherie! 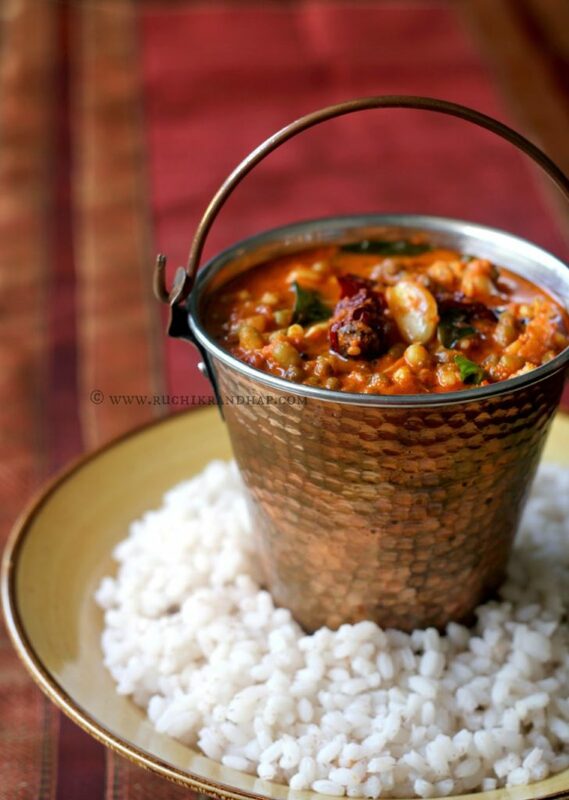 When paired with our Mangalorean red rice (boiled rice variety) this curry can satiate one’s soul. Pair it with papad and pickle on the side and you won’t miss a non veg dish that day. For those who are keen to know where I buy my red rice in Dubai, well, there is this variety called ‘Palakkadan Matta’ that is the in house brand marketed by Lulu Supermarkets. The rice that comes in a transparent bag with a green label is the one I pick. There is another one that is called as ‘Sortex Long Grain Palakkadan Matta’ which I was not happy with. So there! You have your info, so go find that rice and make some today and also prepare this lovely curry and enjoy it too! 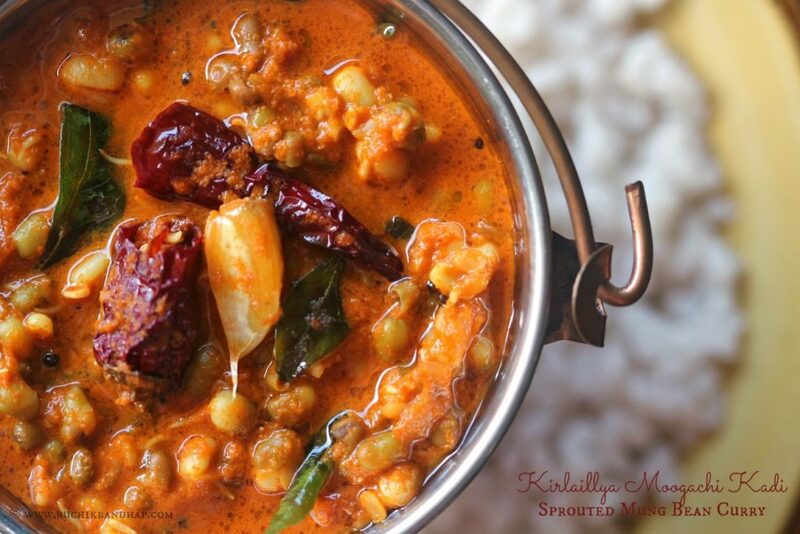 And hey, by the way, this is one of those curries that is made by every community in our culturally diverse Mangalore. It goes by different names – Hesaru Kalu Bendi, Hesaru Kalu Ghassi, Mooga Ghasshi, Pandengi Ghassi and Kirlaillya Moogachi Kadi. One dish, so many names! I love my Mangalore! 2. Heat a tawa/skillet and dry roast the red chillies, coriander and cumin one by one till aromatic (take care not to burn them). Allow to cool until crisp and then grind along with the coconut and a couple of tablespoons of water, till you get a fine paste. Rinse the mixer jar with 3/4th – 1 cup water and reserve it. 3. Add the ground paste to the cooked sprouts, mix and then add the reserved masala water – adjust consistency of the gravy as desired. Check salt to taste and simmer the curry for 2-3 mins. Remove from heat. 1. To sprout your own mung beans, soak them in plenty of water for 8-10 hours. I usually start the process a day in advance. For ex: If I want to cook sprouts on Sunday, I soak the mung beans in ample amount of water on Saturday morning (around 8-9 am). After it has soaked the whole day, at night, discard the soaked water and place the mung beans in a muslin/cheesecloth and bundle it up. Place this bundle in a small bowl and sprinkle a little water over it. Keep the bowl in a warm corner of your kitchen to aid germination. The next morning the mung beans would have sprouted. For best results, cook the mung beans when the sprouts are still small and tender, the shorter the sprouts, tastier they will be. 2. To pressure cook the sprouts place them along with the onions and tomatoes in a cooker and sprinkle approx 1/2 cup of water and mix well. Cover the lid and place the whistle and cook on full heat for one whistle. Immediately take the cooker off the heat and place it slightly tilted in the sink and turn on the tap of water so that water falls on the base of the cooker (not directly over the lid). This will help the cooker to cool down immediately and you will notice that the weight (whistle) has loosened up completely. Open carefully and stir gently. Vegetables cooked this way will be cooked just right and not turn mushy. tastes good- but not mentioned about tamarind in the method. Thanks for this recipe. It came out very well. I followed it to the T, only change I did was to add a bit of jaggery to balance the tangy tamarind taste.